…or not. 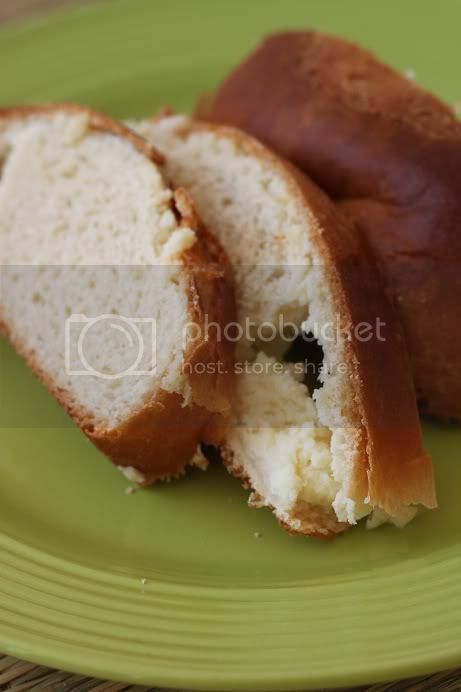 After all, I am going to start off my healthy kick by blogging about Cheese Babka. Well, you’ve gotta eat something sweet sometime, or else you’ll fail at your goal! So here you go, one more rich, delicious baked good posting before the healthy things begin. 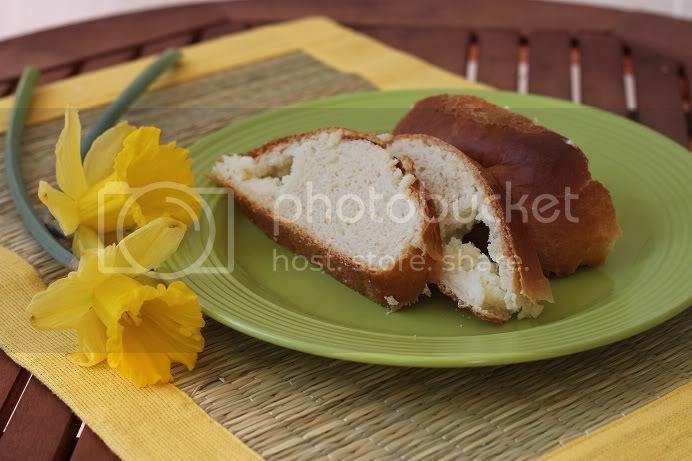 This is an Easter treat with Eastern European roots that we enjoy at my in-laws every year, and as we were spending the holiday up north where there are less Eastern European bakeries to frequent, I decided I would whip some up myself. Cheese is our preferred Babka – definitely no lesser Babka for our dinner! Making your own Babka is time consuming, but man is it worth the effort when you have checked every bakery in the area with no luck. The perk is much of the time is unattended – ie, letting the dough rise and such. 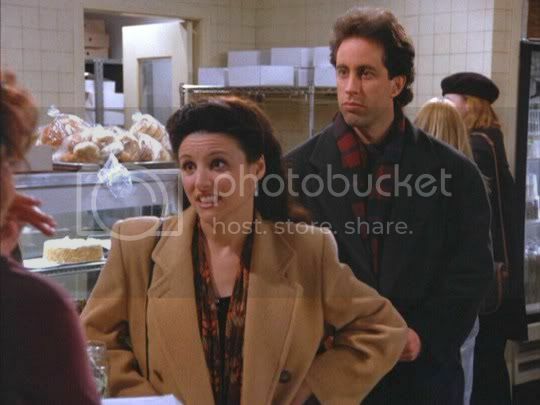 Plus, this makes 3 loaves of Babka – so you can share with friends. The recipe I found calls for a crumb topping – however, the Babka I usually enjoy does not have this so I simply omitted it. Compared to other Babka recipes, this really is a healthier Babka – only 4oz butter, and I substituted one whole egg for 2 of the egg yolks. Plus, I used light cream cheese. It came out fantastic. Stir yeast and warm water together and set aside for about 5 minutes, or until mixture appears frothy. Grease 3 standard-size loaf pans. In the bowl of your trusty stand mixer, add hot milk, butter, sugar and salt mixing well until butter is melted. To the warm milk mixture, add egg, egg yolk, and yeast mixture. Add flour gradually to the bowl as the machine kneads using the hook attachment. Knead for several minutes, or until dough appears smooth and elastic. (I had to add a little extra flour at this point, probably about 1/4 cup more). Place ball of dough into a greased bowl, turning to coat complete. Cover loosely with plastic wrap, and let rise in a warm place until doubled – about 2-3 hours. When dough is nearly completely risen, prepare cheese filling by combining all ingredients and mixing well. Set aside. Divide dough into 3 equal portions. On a lightly floured surface, roll one portion out to approximately 1/4 inch thickness. Spread 1/3 of cheese filling onto the dough. Fold ends inward and roll the dough up, placing it seam-side downwards into the prepared loaf pans. Repeat with the other 2 portions of dough. Brush dough with the egg wash. Cover lightly with greased plastic wrap (so the bread doesn’t stick to it!) Let loaves rise again in a warm place for an additional 2 hours or until they again appear doubled, peeking over the tops of the loaf pans. Preheat oven to 350 degrees. Place 3 loaf pans side-by-side on a rack placed in the middle of the oven. Bake for about 45-50 minutes, or until a skewer comes out clean when inserted into the center of the loaf. Cool in pan 5 minutes, then loosen the sides of the loaves. Cool another 30 minutes. Then remove loaves from the pans and let cool completely. Enjoy! I am a ‘scanner’ and video just won’t let me do because. You can place a review page in the site reviewing a associated with products. I’ve read a few excellent stuff here. Certainly value bookmaarking for revisiting. Iam regular reader, how are you everybody? This piece of writing posted att this web site is genuinely nice.